Hybrid SUVs and crossover utility vehicles remain rare compared to the growing array of hybrid passenger sedans and hatchbacks. So we've been eager to test the new 2014 Nissan Pathfinder Hybrid, one of only four hybrid crossovers. MORE: 2014 Nissan Pathfinder Hybrid: Is It Hybrid Enough To Matter? It's only a mild hybrid, unlike Toyota and Lexus competitors, and we've had our doubts about whether it can deliver its rated gas mileage in real-world use. 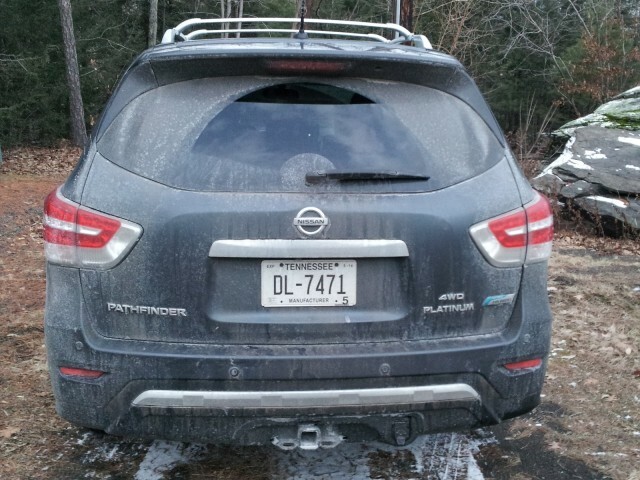 After spending more than a week with a Pathfinder Hybrid over the end-of-year holidays, the news isn't good. The 2014 Pathfinder Hybrid is rated at 26 mpg combined (25 mpg city, and 27 or 28 mpg highway for all-wheel-drive and front-wheel-drive models respectively). Over 573 miles of mixed use, roughly two-thirds highway and one-third urban and suburban stop-and-go, the car's in-dash fuel-economy reading settled at 19.5 miles per gallon. That is, regrettably, fully 25 percent lower than the combined EPA rating. And that shortfall is the highest we've ever recorded among more than 200 cars we've tested over the last five years. It's even worse than our test last summer of the 2013 Fiat 500 Abarth Cabrio, the Italian hot hatch with the alluring exhaust note that begs to be driven as hard as you dare. The little Fiat hot rod is rated at 31 mpg combined, and we got 24.9 mpg--almost a 20-percent difference. 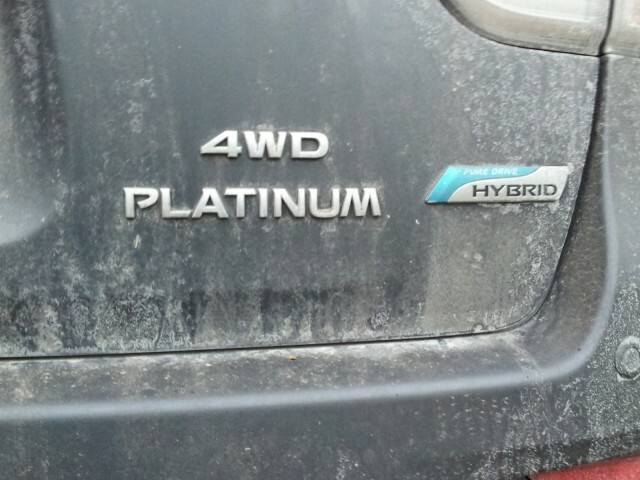 The hybrid Pathfinder was worse. The hybrid Pathfinder uses a supercharged 2.5-liter four-cylinder engine, with a 15-kilowatt (22-hp) electric motor sandwiched between the engine and an adapted version of Nissan's continuously variable transmission (CVT). To its credit, Nissan offers the Pathfinder Hybrid in several different trim levels--including the mid-level SV model--and offers a choice of front-wheel or all-wheel drive on every one. Behind the wheel, though, it's not a very rewarding driving experience. In stop-and-go traffic, the hybrid Pathfinder is lumpy, with surging clearly perceptible as the motor and engine clutch in and out, adding and subtracting two very different power outputs. The engine stayed on virtually all the time, idling at 1100 rpm, even when fully warmed up and stopped at traffic lights. We saw almost no idle-stop at all. And during the entire week, we saw the powertrain kick into electric-only mode only a small handful of times, generally at steady speed on gentle downhill slopes. The "EV" mode light in the dashboard stayed resolutely off. When floored, the supercharged four produced sufficient power to move the big SUV away swiftly, occasionally even chirping the tires. But the price for that power was a loud and noticeable engine roar intruding on the usually quite quiet and calm interior. 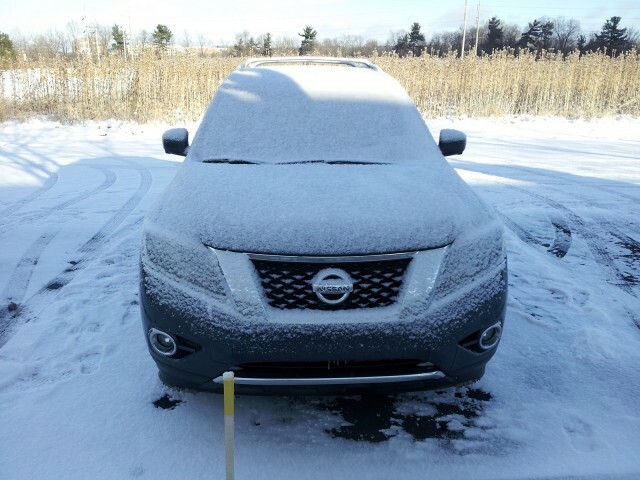 To be fair, we tested the big hybrid crossover during the winter, when hybrid efficiency can fall 10 percent or more. And we did more than half our miles on the highway, where there's little benefit to the hybrid system. 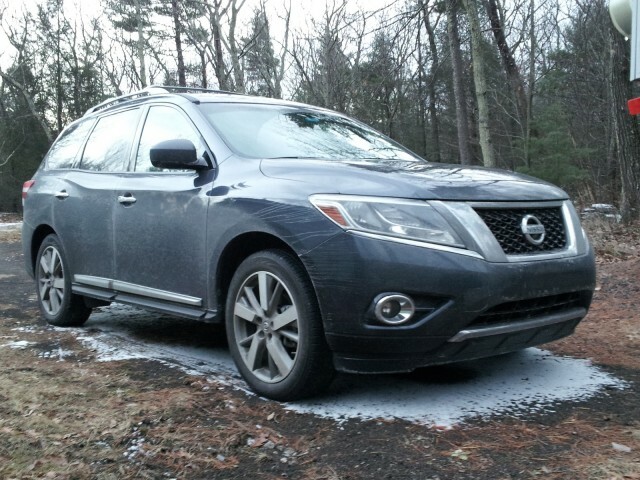 We're sufficiently troubled by the shortfall that we'll try to test a Pathfinder Hybrid again this summer, in lower-speed and more stop-and-go traffic if we can manage it. That said, ideal conditions will have to be warm, but not too warm, since using the air conditioner requires the engine to stay running--rather than switching off when the vehicle is stopped. For comparison purposes, the standard 260-horsepower V-6 Pathfinder with front-wheel drive is rated at 22 mpg combined (20 mpg city, 26 mpg highway). Opting for all-wheel drive cuts that to 21 mpg combined (19 mpg city, 25 mpg highway). Our Pathfinder overall did pretty much everything we asked it to do, hauling people, luggage, and cargo on holiday trips to relatives, shopping trips, mall runs, and the like. One of the selling points of the new-for-2013 Pathfinder is that its rear seat folds and slides forward to provide entry to the third row with a child-safety seat still strapped into the second row. That's a desirable feature for families--though a colleague who's also the mother of small children noted that the feature doesn't work with rear-facing seats for the youngest children, nor for booster seats for older children not quite large enough for regular seat belts. Competitors for the Nissan Pathfinder Hybrid are probably limited to the Toyota Highlander Hybrid, which also offers third-row seating. Toyota's hybrid system, however, provides all-electric running below about 20 mph, and under light loads, which the hybrid Pathfinder doesn't. The most popular such vehicle is the Lexus RX, now in its third generation, which really defined the luxury hybrid crossover. Its competition is the Infiniti QX60 Hybrid, a more luxurious seven-seat model using much of the structure of our test vehicle--including an identical powertrain. 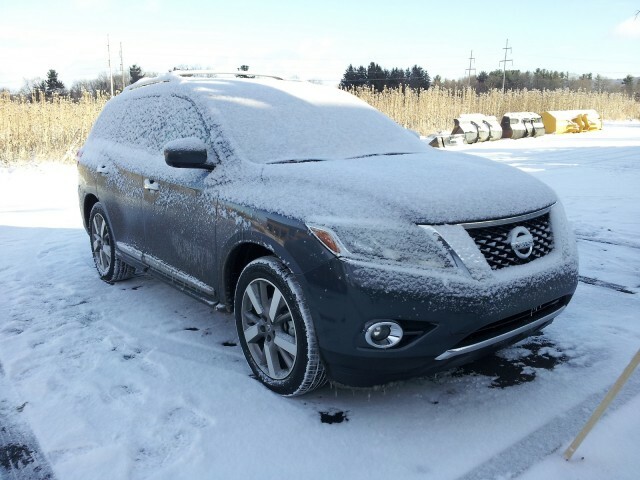 While the base front-wheel-drive Pathfinder Hybrid SV starts at $35,970 (with delivery), our test car was a top-of-the-line Pathfinder Hybrid Platinum 4x4 model, with a base price of $45,350 (before delivery). The optional $2,300 Platinum Premium package added a dual-panorama moonroof with power sunshades, a tri-zone entertainment system with DVD screens in the back of each front seat headrest and wireless headphones, and auxiliary input jacks for audio and video in the rear. On top of that, our test car had $200 of optional floor mats, and a mandatory destination fee of $860. Unusually for media-fleet cars, our test vehicle also had a trailer hitch and wiring harness for towing. The bottom line on the window sticker for the vehicle as tested was $47,710--or $18,000 more than the base V-6 Pathfinder S model including destination. We're left feeling that the big Pathfinder is a competitive new entry in the seven-seat crossover utility segment, and should do well against the Ford Explorer, Honda Pilot, Toyota Highlander, and the trio of GM large crossovers: the Chevrolet Traverse, GMC Acadia, and Buick Enclave. But is the hybrid powertrain worth the $3,000 premium over a comparably equipped V-6 Pathfinder? Based on our experiences to date, we're hard-pressed to make that case.